While Android 7.0 Nougat has been available for over a month, if your device is not a Nexus, you can't get this new version of the OS yet. But various manufacturers should soon start updating select phones to Nougat, and Motorola is one of them. According to Droid-life, a Motorola spokesperson confirmed that Android 7.0 Nougat should be available to the Moto Z family and the Moto G4 family starting "in Q4." Q4 means the months of October, November, and December, so Nougat updates could be hitting Moto handsets as early as next week (highly improbable), and as late as the end of the year. Motorola didn't specify which Moto Z and Moto G4 models are getting Nougat in the fourth quarter, so we assume that all of them will: Moto Z, Moto Z Droid, Moto Z Force, Moto Z Force Droid, Moto Z Play, Moto Z Play Droid, Moto G4, Moto G4 Plus, and Moto G4 Play. Right now, there's no word on when older Motorola smartphones - like the Moto X and G series from 2015 - are supposed to get Android 7.0 Nougat. 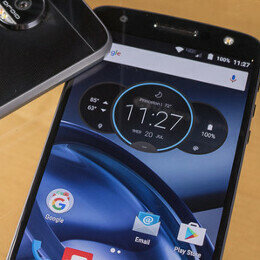 But Motorola says it's going "share upgrade plans for other products and more specific timing later." We'll certainly keep an eye on Moto's Nougat updates plans, and let you know when we hear more about them. Wow, Android Nougat update in Q4. That's pretty fast. Wonder if it's fully baked... I don't want a half-baked firmware in the name "fast updates"! Still slow when compared to iOS. This is the reason Android will always stay second fiddle to iOS. The level of comments on this site seem to be, for the most part, infantile....good for a laugh. Stop trolling, kinda rather pathetic and sad. Why not compare pears with pears as in iPhone with Nexus in terms of timely upgrades? You'll have to have the IQ of a 5 year old to bring in OEMs with their skins etc into the equation....just had to say....! There's a hole in your joke. The Moto Z Play has one. Was that before or after they laid off all those fine folks? Moto better to do what he promised, " Droid Turbo will get marshmallow ", when? don't forget what you build & what you promised. Next quarter? Seriously? Moto does not customize Android as much as other OEMs do.